1. Stay one step ahead of the insurance company by having us contact the witnesses first. It is important that you retain an attorney quickly so that statements and evidence can be timely secured in the proper fashion. Insurance Companies are notorious for getting to the witnesses early. These efforts are made to achieve a version of the incident best suited to their need to defend against future claims. Staying one step ahead of the insurance company will serve your best interests in seeking the highest possible recovery. 2. Ask us to counsel you before you make the decision to provide the recorded statement that is routinely requested by the insurance company. Very shortly after your accident, an insurance company representative may contact you and request that you provide a tape-recorded statement of what transpired. Their quick action is in part motivated by their efforts to speak with you before you have had the opportunity to consult with an attorney. The insurance adjuster often later uses these statements against you in an effort to deny or limit your recovery. At the time of your statement, an injury may not have yet manifested itself, since many people may not feel the effects of an injury for several days or weeks. Don’t fall prey to an insurance adjuster’s position that your case cannot be settled without your recorded statement. If you do not speak with an attorney or have him present with you at the time your statement is given, it could jeopardize your recovery. Admissions or statements made during this recorded session are often taken out of context, misinterpreted, or used to show inconsistencies with accounts later provided by you. 3. Get the appropriate doctor or health care provider. Your local hospital emergency room or walk-in clinic is equipped to diagnose and treat broken bones and open wounds. However, you may suffer from other injuries that may be equally as serious but not yet diagnosed. Doing nothing can only aggravate your injury. It is therefore important to seek the help and treatment of an appropriate health care provider or specialist. These doctors are equipped to properly document the nature and extent of your injuries so as to provide your attorney with the best tools to later negotiate the highest possible recovery. 4. Don’t fall prey to the insurance company’s hype and propaganda. These multibillion-dollar insurance companies are masters at manipulating public opinion. They are heard to complain that their continued payment of settlements will not only result in higher premiums, but could also jeopardize their ability to stay in business. Yet the insurance industry continues to grow more profitable each year. By reducing the number and amount of claims paid out, an insurance company can effectively increase their profit margin. Their priority is to minimize claims so as to earn a substantial profit for shareholders. It is therefore not uncommon for the insurance company to drag its feet before paying benefits or to persuade uninformed people to accept less than what their case is truly worth. 5. 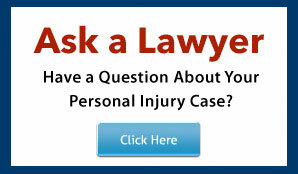 Use a lawyer to negotiate your claim who knows the insurance company’s arsenal of strategies and tactics. If you have ever dealt with big corporations you know that they can be intimidating and tough in their negotiations. St. Petersburg Personal Injury Attorney Colleen Russo started her career in 1984 working for large insurance companies in the defense of personal injury claims. She knows both the strategies and tactics used by the insurance industry. She also understands their areas of weakness. Someone who has learned their opponent’s technique and approach from the inside, is obviously in the best position to anticipate and effectively overcome any obstacles that might be presented. 6. Call our office for a free consultation because “Doing Nothing” is one of the worst mistakes you can make. Countless people are injured each year who are entitled to a fair recovery for their injuries, yet they fail to take any action to claim the compensation they deserve. These same people often tell us that they were intimated by the cost of the anticipated medical care or overwhelmed by the thought of having to negotiate through the red tape and barriers set up by the large insurance companies. Likewise, with the passage of time, the “statute of limitations” may permanently bar you from ever achieving a recovery at all. By calling us for a free consultation, we can provide you with a pressure-free atmosphere in which you may feel comfortable talking with a highly experienced attorney about your legal options. It is an opportunity for us to answer any questions that you may have. We urge you to take this first step in doing what is necessary for the best interests of you and your family.